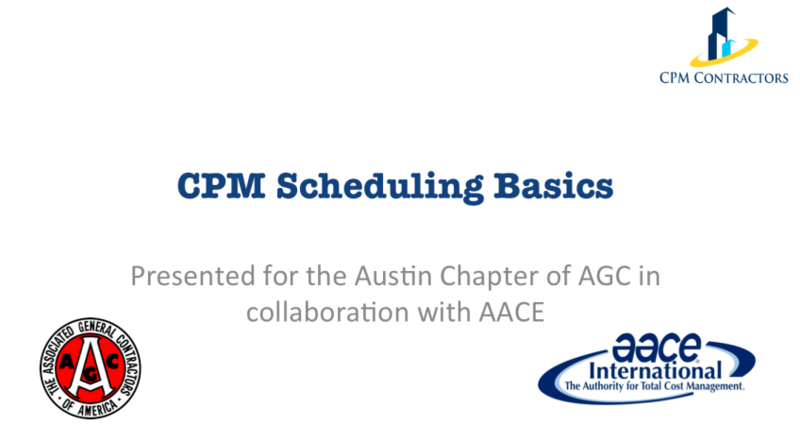 Today Fred Zwar presented on the Critical Path Method at the AGC Austin. More information on the presentation is included, along with a copy of the PowerPoint. Thanks for a great turnout, participation and questions. Looking forward to the next one! Still have questions? Send us an e-mail at contact@cpmcontractors.com and we will respond within 24 hours. The most widely used scheduling technique is the Critical Path Method (CPM) for scheduling, often referred to as critical path scheduling. This method calculates the minimum completion time for a project along with the possible start and finish times for the project activities. Indeed, many texts and managers regard critical path scheduling as the only usable and practical scheduling procedure.